Knowledge and experience -- a combination of paramount importance when dealing with concrete restoration. A four step procedure sets the basic scenario for this serious problem. First, the areas are inspected and hammer-tested and all deteriorated portions are cut out as far as necessary to reach solid material. Secondly, any steel reinforcement remaining must be cleaned of rust and treated or removed. The third step calls for the installation of anchors, and reinforcements of various designs. Finally, the cavity is filled with latex, epoxy, or polymer modified, non-shrinking mortars. Placement of the mortar cements can be accomplished by the hand trowel method in layers and/or with air placement (shotcrete) equipment. All design mixes are individually tailored to meet specific job needs. 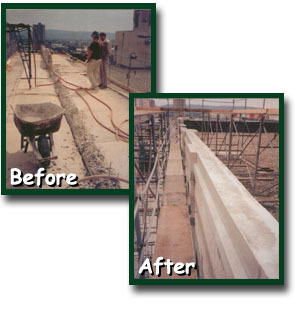 Keystone Waterproofing possesses a wide range of expertise in the use of materials such as polymer concrete, non-shrink grouts, plastisizers, latex bonding agents, accelerators, special aggregates and epoxies.